Chocolate Candy Bark with Nuts-You’ll love the crispy surprise in this chocolate bark. Chocolate bark with caramelized nuts is perfect for anytime of the year but especially for the holiday season. These sweet treats are so easy to make with only 3 ingredients! 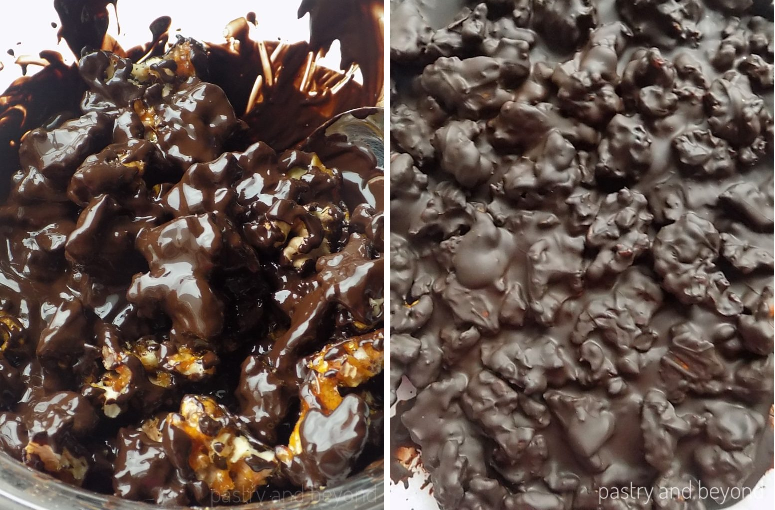 Today I am sharing chocolate bark with caramelized walnuts. You can use any other nuts you like. I can say they are also so yummy with pistachios, almonds and hazelnuts. 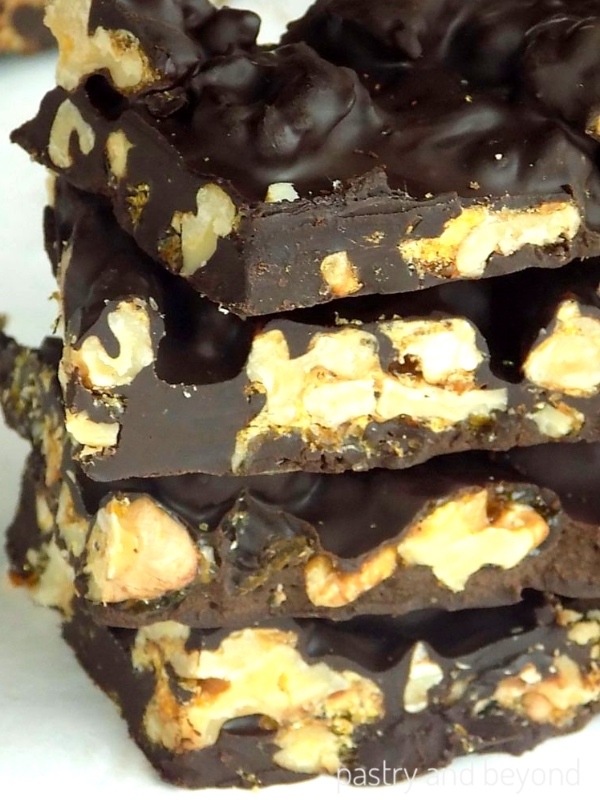 This is a delicious chocolate bark recipe with crispy surprise inside. If you have already made my candied hazelnuts, you know how delicious they are. 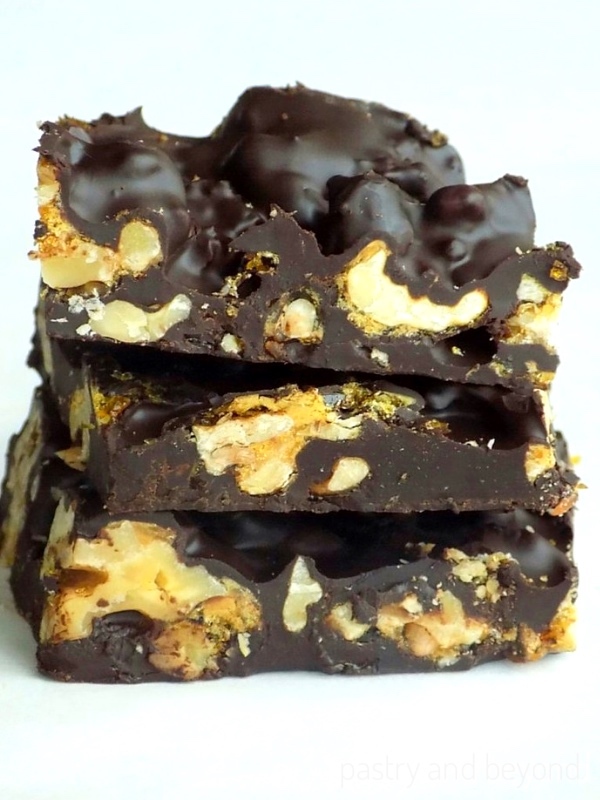 I go further with this walnut candy bark recipe. I caramelize the sugar just like I did in my candied hazelnuts. Then I stir them into the melted chocolate. It seems as if it is a simple chocolate bark from outside but with your first bite, you realize the candied walnuts which add so much richness to these nut barks. 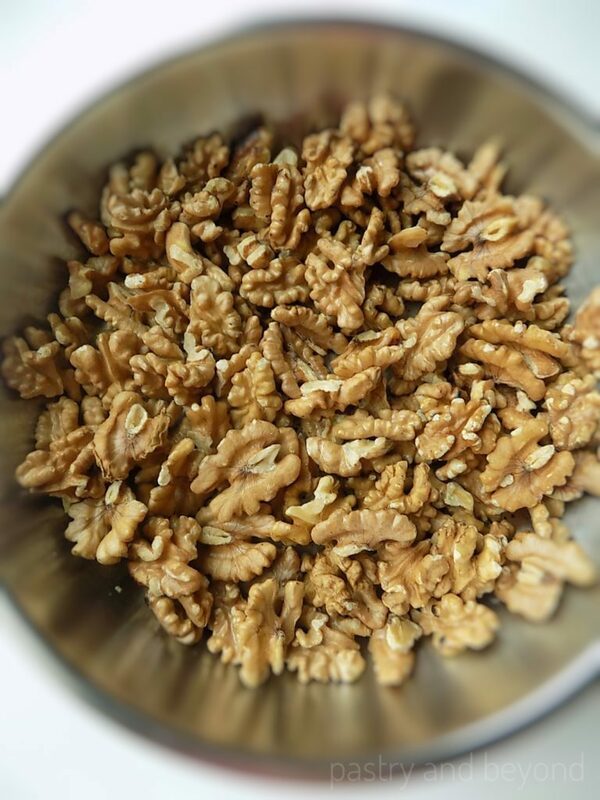 If you will use walnuts in this recipe just like I do, make sure your walnuts don’t have a bitter taste. 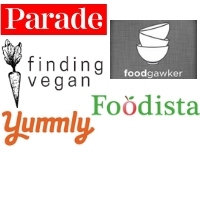 If they are bitter, the bitter taste might stay in your mouth. I start with toasting the walnuts. I put them in a pan and toast over medium heat. I stir from time to time prevent them from burning. You can understand that walnuts are toasted when they give off their aroma. This step takes almost 5 minutes. I set aside the pan. But now I use the dry method here: I place the sugar in a heavy bottomed large pan and let the sugar melt without stirring but swirling the pan. You can see the steps below. 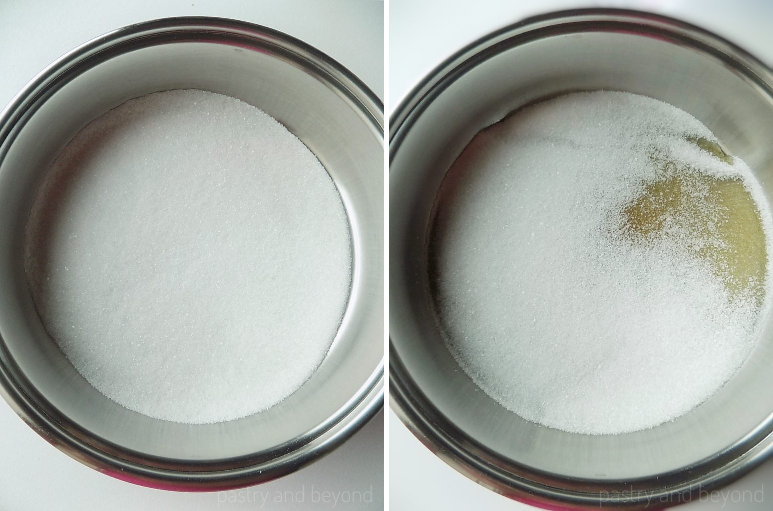 When I swirl the pan after the sugar almost melts halfway(left picture), melted sugar covers the unmelted sugar and this way the sugar almost melts completely in the middle picture. I start to stir with my spatula to make sure the sugar completely melts. During the caramelizing process, if sugar crystals form on the sides of the pan, you can brush down with a pastry brush that is dipped in cold water. Then I remove the pan from the heat and immediately add the toasted walnuts and coat the walnuts with caramelized sugar with my spatula. I place the walnuts on to the parchment paper and try to flatten as much as I can with my spatula. While caramelized walnuts are cooling, I melt the chocolate over bain-marie; I place the chopped chocolate into a heat proof bowl that sits over a pan of simmering water and stir often until the chocolate melts. I break the walnuts into small pieces before mixing it with melted chocolate. Then I add them into the melted chocolate and stir. After all the walnuts are covered with chocolate, I place the mixture on a small baking sheet lined with parchment paper and refrigerate for at least 20 minutes until set. Finally, I use a sharp knife to cut into pieces as I like. 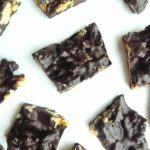 This recipe makes 20 med-big pieces or 40 small bite size pieces which can be a perfect gift for the holiday season Enjoy!. 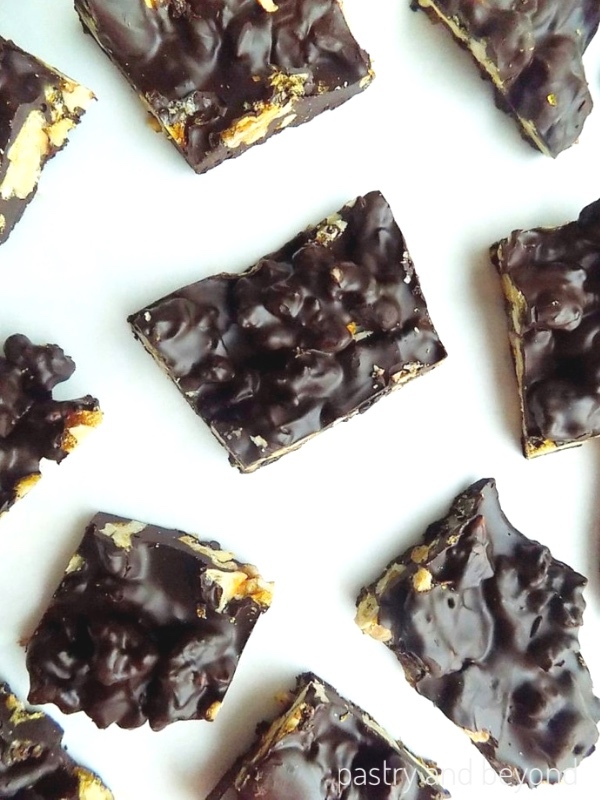 You'll love the crispy surprise in this delicious chocolate bark. Chocolate bark with caramelized nuts is perfect for anytime of the year but especially for the holiday season. These sweet treats are so easy to make with only 3 ingredients! Line a baking sheet with parchment paper or silpat and set aside. Put the sugar in a big pan over med-low heat. Don't stir but swirl the pan so the sugar can melt evenly. If sugar crystals form on the sides of the pan, you can brush down with a pastry brush that is dipped in cold water. When some parts of the sugar melt and some parts don’t melt, use your heat proof long spatula to put the melted sugar on top of unmelted sugar. This step helps melted sugar not to burn but unmelted sugar to melt. You have to be fast and careful when doing this step. If there are still some unmelted sugar pieces, using a heat proof long spatula, start stirring. They will easily melt. 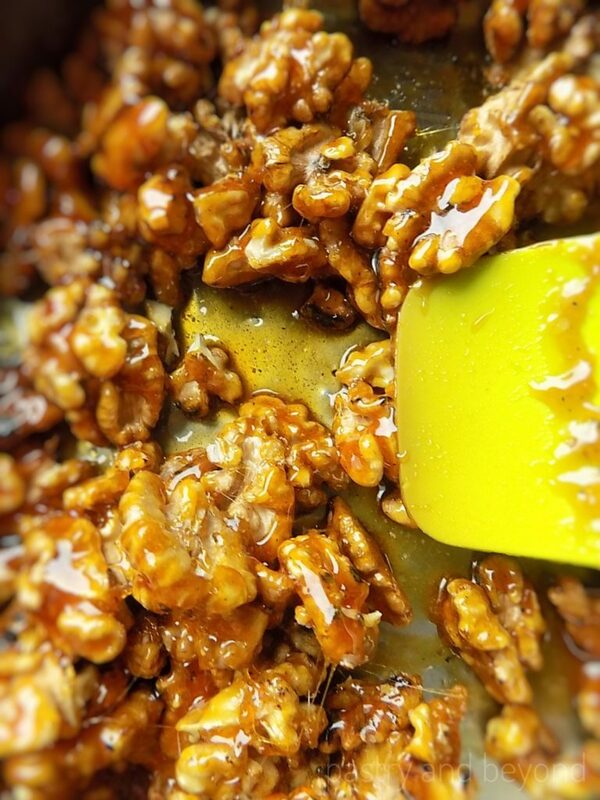 As the sugar turns amber in color, immediately add in the walnuts and stir with a spatula quickly but carefully. 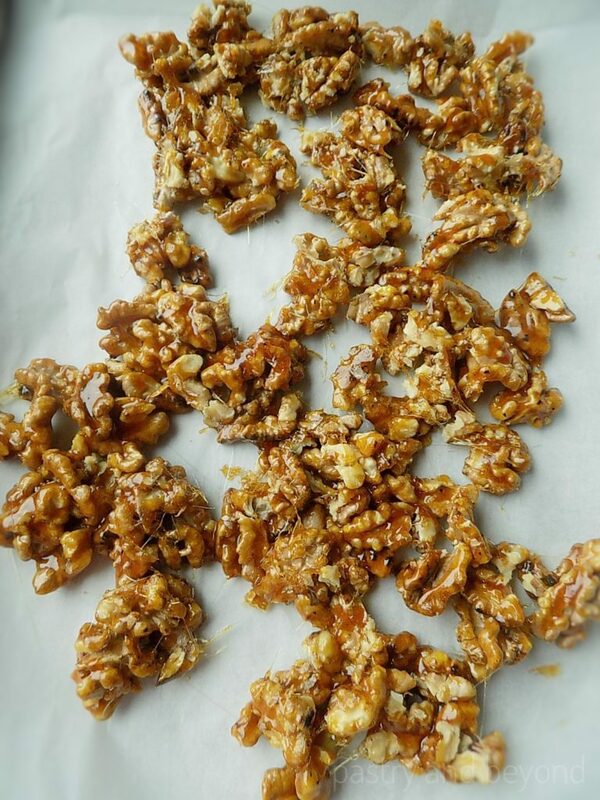 Remove the pan from the heat and place the caramelized walnuts on a parchment paper and immediately flatten the walnuts with your spatula-don't let the walnuts stay as a big cluster(after the sugar is hardened you can't flatten them). 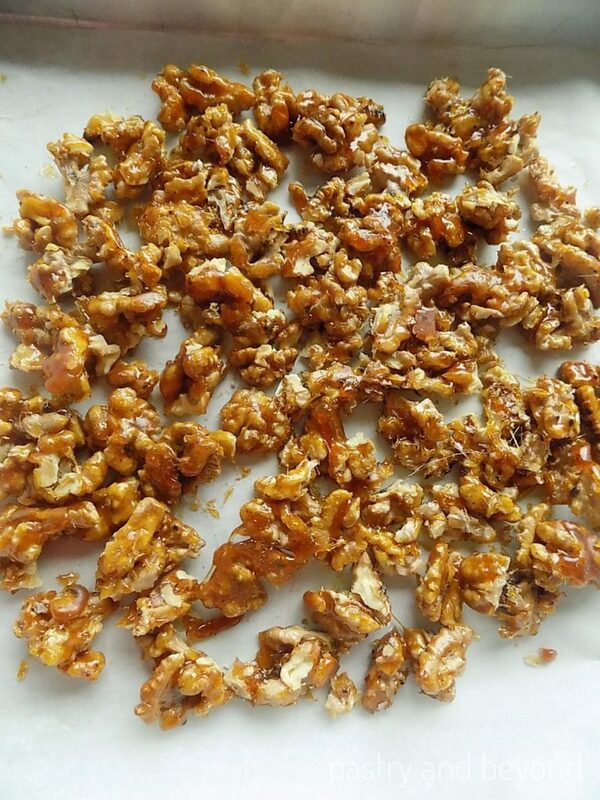 Break the caramelized walnuts into small pieces or cut with a sharp knife. 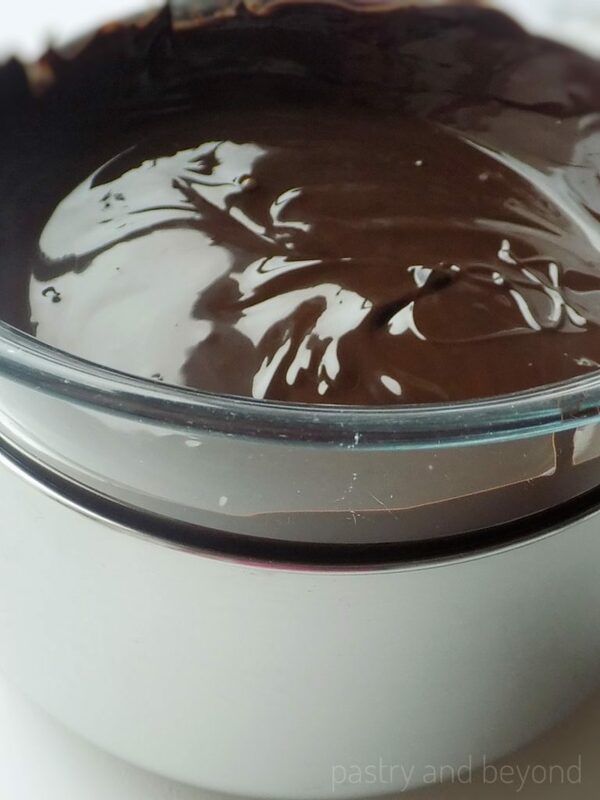 Melt the chocolate over bain-marie. Place the chopped chocolate into a heat proof bowl that sits over a pan of simmering water. Stir often. Add in the caramelized walnuts and stir until all the walnuts are covered with chocolate. Take the mixture on a baking sheet or a dish that is lined with parchment paper and spread. Keep the mixture in the refrigerator for at least 20 minutes until set. Cut into pieces as you like. *You can substitute walnuts with any nut you prefer. Update Notes: I originally shared this recipe on December 19, 2016. Today I republish with new photos.